[Source: Ernesto del Aguila III, National Human Genome Research Institute, National Institutes of Health]. The regents of the University of California (UC), the University of Vienna, and CRISPR pioneer Emmanuelle Charpentier, Ph.D., director and scientific member at the Max Planck Institute of Infection Biology, Berlin, have been granted a third CRISPR-Cas9 patent by the European Patent Office (EPO) this week. EPO Patent No. 3,401,400 claims methods and compositions of using CRISPR/Cas9 to modify DNA and regulate gene activity in eukaryotic cells, including kits to carry out such work. The patent was disclosed through publication by EPO on Wednesday. Charpentier is listed as one of seven inventors on the patent, along with another CRISPR pioneer, Jennifer Doudna, Ph.D., of UC Berkeley; Doudna’s husband Jamie H. Doudna Cate, Ph.D., of UC Berkeley; Krzysztof Chylinski, Ph.D., of University of Vienna, a onetime postdoctoral student of Charpentier; Martin Jinek, Ph.D., of University of Zurich, a onetime postdoctoral student of Doudna; Wendell Lim, Ph.D., of UC San Francisco; and Lei Stanley Qi, Ph.D., of Stanford University. “The most common use for CRISPR/Cas9 is in eukaryotic cells, including human and animal cells. We are pleased to have another comprehensive patent covering methods, compositions and kits for such uses which adds to our portfolio of patents which have issued in over 40 countries worldwide,” Eric Rhodes, CEO of ERS Genomics, a licensee of the new patent, said in a statement issued by the company on Wednesday. ERS’ exclusive worldwide license from Charpentier is for foundational intellectual property covering CRISPR-Cas9 for all applications other than use as a human therapeutic. ERS’ foundational IP covers broad and dominant claims covering CRISPR/Cas9 compositions and methods of genome editing in any organism. UC has encouraged commercialization of its technology through an exclusive license with Caribou Biosciences. Caribou has sublicensed the UC’s patent family to numerous companies worldwide, including Intellia Therapeutics for certain human therapeutic applications. Additionally, Charpentier has licensed the technology to ERS Genomics as well as CRISPR Therapeutics. The latest EPO patent comes weeks after the U.S. Patent and Trademark Office (USPTO) granted UC and its partners a third U.S. patent related to CRISPR-Cas9 claims. U.S. Patent No. 10,227,611, “Methods and compositions for RNA-directed target DNA modification and for RNA-directed modulation of transcription,” covers the use of single molecule RNA guides and Cas9 protein in any cell, with the aim of creating efficient and effective ways for scientists to target and edit genes. Methods of site-specific modification of a target DNA and/or a polypeptide associated with the target DNA. Methods of modulating transcription of a target nucleic acid in a target cell, generally involving contacting the target nucleic acid with an enzymatically inactive Cas9 polypeptide and a DNA-targeting RNA. Kits and compositions for carrying out the methods. Genetically modified cells that produce Cas9; and Cas9 transgenic non-human multicellular organisms. The second European patent was granted last year to UC and partners. EPO Patent No. 3,241,901, covers claims that are directed to compositions and uses of a chimeric version of the Cas9 protein, most often associated with use in regulation of gene expression as opposed to direct editing of the genetic code itself. The patent covers uses in both cellular and non-cellular settings, including use in bacteria, plants, animals, and cells from vertebrate animals such as humans. 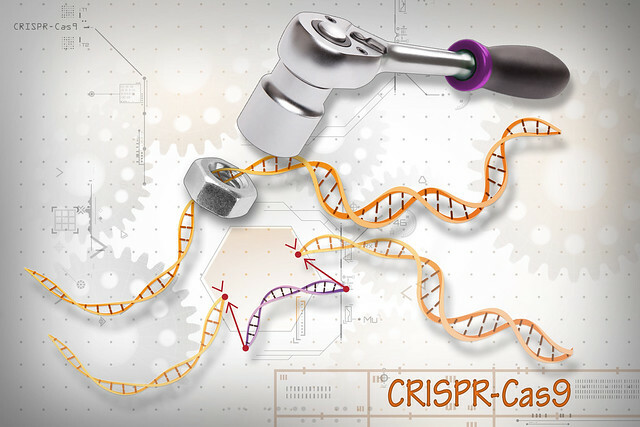 A Dose of CRISPR: Can Gene Editing Cut It in the Clinic?